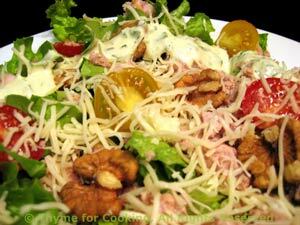 Tuna and Walnut Salad, Healthy Weekly Menu Plan. One of the pleasures and benefits of seasonal cooking is summer salads that require none.... cooking, that is. Make the dressing, assemble the salad and eat. For heartier appetites, add some bread with the salad or summer fruit for dessert.